At the 2018 United Airlines NYC Half, a record 21,965 finishers traveled 13.1 miles over a brand-new course that started just outside of Brooklyn’s Prospect Park and finished inside Central Park, crossing the Manhattan Bridge, where runners took in skyline views of Brooklyn and Queens, and passing iconic spots like Grand Central Terminal and Times Square along the way. Making his half-marathon debut, Ben True broke the tape in 1:02:39, becoming the first American to win the men’s open division in NYC Half history. On the women’s side, just one tenth of a second separated Ethiopia’s Buze Diriba and runner-up Emily Sission of the USA—Diriba secured the top spot with a time of 1:12:23. In the fifth year of the professional wheelchair division at the NYC Half, South Africa’s Ernst van Dyk was winner on the men’s side in 53:12, marking his fourth-straight NYC Half win, an event record. On the women's side, 2017 TCS New York City Marathon champion Manuela Schär of Switzerland broke the tape in 59:57. Read more about the pro races at the 2018 United Airlines NYC Half. Among the 2,000 volunteers who supported runners along the course was one man who went above and beyond his duties for the day—after putting a finisher medal around his girlfriend’s neck, he put a ring on her finger. #NYRRVols team member Ricardo had a #UnitedNYCHalf finisher medal waiting for his girlfriend, Lori—plus a little something extra 💍 Congratulations, and here’s to many more miles together! Just as volunteers were giving back to the running community, thousands of runners lined up in support of one of the race’s 142 official charity partners. At the 2017 United Airlines NYC Half, charity runners raised approximately $5 million, and 2018 looked to be another strong year. NYRR’s own charity team, Team for Kids, included more than 300 runners making the inaugural trip from Grand Army Plaza to Central Park. The NYRR Team for Kids cheer zone awaited them in Times Square, powering them through the second half of the race. TFK takes on the FDR at the 2018 United Airlines NYC Half. Also in Times Square, hundreds of kids stopped traffic at the Rising New York Road Runners at the United Airlines NYC Half, making this the fourth year that the race has hosted an event for youth in Times Square. This 1500-meter out-and-back run—nearly a mile—took youngsters on a course up Seventh Avenue from 47th Street to a turnaround near 57th Street, and back. 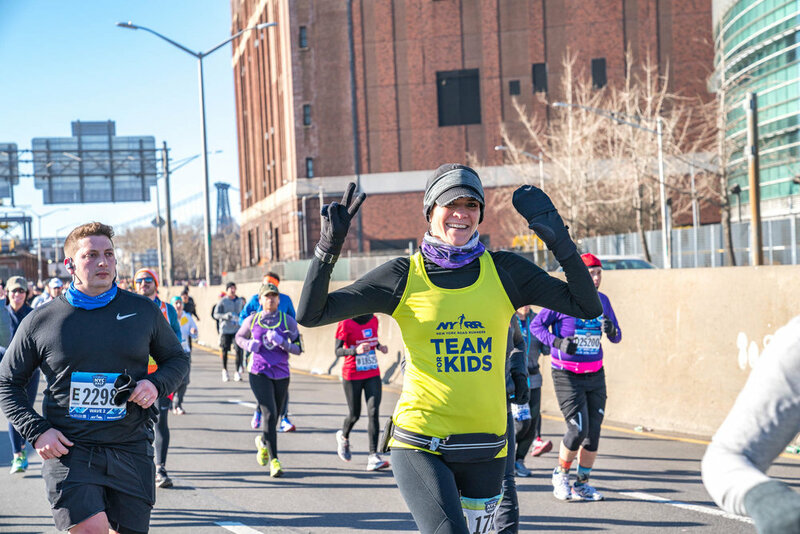 Never mind the cold—these students, ages 8–18, heated up NYC’s most iconic landmark and ran right alongside the United Airlines NYC Half runners as the adults made their way toward Central Park. The event featured 889 finishers, a record number. All the participants received pompom hats before the start, and every finisher got a medal. “They love this run,” said coach John of MS 447X Creston Academy in the Bronx. “We met this morning at 6:15 a.m. to get here. It’s great for their motivation and great for building community.” Many of the 33 kids who took part today also ran the Rising New York Road Runners at the NYRR Washington Heights Salsa, Blues, and Shamrocks 5K on March 4. The run featured multiple heats, starting with a youth wheelchair race for participants in the NYRR Youth Wheelchair Training Program. First across the finish line for the girls was Emma Albert, a ninth-grader at Beacon High School in Manhattan and a Rising New York Road Runners Youth Ambassador. Whether they were veterans like Christopher or brand-new to road racing, all the kids went home with memories of being part of a unique and historic NYC event.